Here’s a bit of strange-yet-interesting news to make the wait for E3 feel that much longer: in addition to the usual press conferences (and a few showings from newcomers, like Bethesda and Square Enix), this year’s E3 will have a presser dedicated to the most powerful gaming platform in existence: the PC. 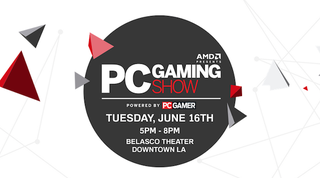 Organized by PC Gamer and hosted by eSports expert Day, the presser will take place on the Tuesday night of E3 (June 16) from 8pm to 11pm ET. They’re promising new game reveals and all sorts of other sizzle you might expect from one of these pressers, although I imagine the “press conference” part won’t actually last three hours. (This news comes via our friends at Kotaku UK). 1) This is during E3, not during Press Conference Day (aka The Best Day Of The Year), so schedule accordingly, especially if you’re one of the lucky folks going to the show this year. 2) Think Square Enix’s going to bring their Japanese games or just stick with Tomb Raider and Deus Ex? My gut says the latter, although they have been bringing a lot of Final Fantasys to Steam recently. It’d be nice to see them port over FFIX or FFXII. 3) It sure is weird that a gaming news outlet is putting on an E3 press conference, no? Something feels kinda icky about that. 4) That said, nice to see the PC get its time to shine at E3.